if you’re looking for a high adrenaline activity look no further than high ropes! Crate Stacking – participants work together, supported by the rest of their group, to build the tallest tower of crates possible – see who can climb the highest, get there the quickest and keep everything together without falling down! Gladiator Challenge – can your team scale this vertical climbing challenge featuring a scramble net and tyres… it’s a race to the top! 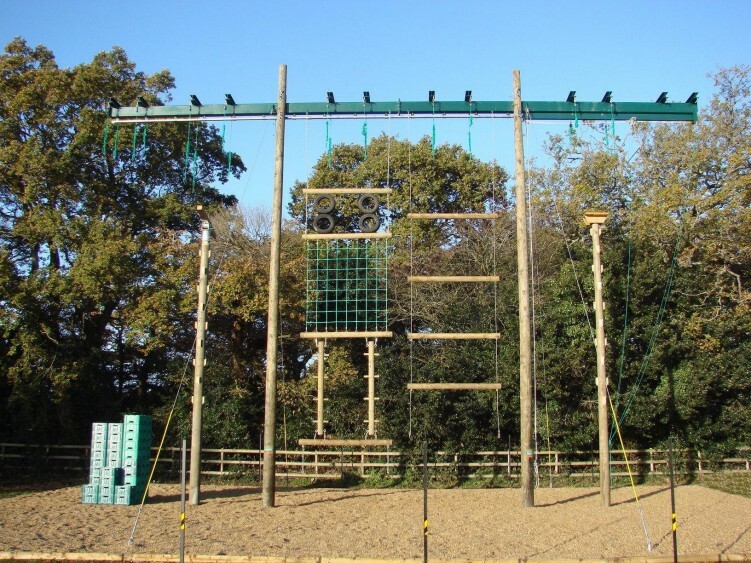 Leap of Faith – a great personal challenge… you climb to the top of a 10 metre pole and, whilst being cheered on by your teammates, make a leap of faith, jumping off the platform (hopefully) on to the trapeze! Zip Wire – our zip wire spans virtually the full length of the main field… participants start by climbing a huge pole at the far end of the site and, once clipped in, fly along the wire to the high ropes at the other end of the field… once your run ends you’ll free-fall abseil down to the ground! High All-Aboard – this challenge requires a team of up to four to stand on a 30cm square platform and lean back together in each others arms… it’s tricky enough at ground level, but you’ll find this platform at the top of a 10 metre pole! High Rigging – race against a friend or just see how high you can reach – climb the rigging! 10 meters up… can you make it all the way?!? Jacob’s Ladder – for the more experienced high ropes group, the Jacobs Ladder is a fantastic team building activity – probably one of the best team challenges you will ever encounter… a team of four work together to get to the top rung of Jacob’s Ladder… it’s not easy, it requires teamwork, communication, trust and strength!